Casa Calisaylá is named for its house founder, the last surviving member of the Karankawa, a group of Indigenous North Americans who lived along what is now the coast of Texas and its islands. Karankawans were completely wiped out by war and disease after contact with the Spanish conquistadors. The house colors are red and gold: red for the blood of the ancestors shed in battle, and for the lifeblood of those who carry on their memories, and gold for the sustaining warmth of the sun. The Karankawa were renowned longbow hunters, especially in shallow water. The arrows on the crest evoke this history, but now also represent the trueness of one’s path and the ability of the skilled archer to determine it. The pearl between the faces represents the inner truth that is hidden within each person, formed over time from a source of vexation into something of great value and beauty. Karankawans also were skilled pearl divers, and lived as well in the water as on land. The coyote is powerful not only for its role as friend of humanity but also as the mediator between life and death. Coyote is a trickster, associated with both creation, and equivocation. The Karankawa people were particularly beloved of Coyote; the name Karankawa means “dog-lover” and domesticated coyote pups lived among them as companions and guards. Like Coyote, interactions with Calisayláns can be a mixture of cunning and mischief. Casa Calisaylá is about borders and crossing between them. The two faces at the top of the crest look back to the past, to those who have gone before whom we honor, mourn, and respect, and to the future that awaits, that is left to the living to create. It also means never forgetting what has been lost, the ancestors and artifacts eradicated by conquerors, and the fierce protection of family, beloved, and precious cultural and magical objects to ensure their safety. The faces are indistinguishable as male or female, as Calisaylá did not hold to the gender binary. Gendered pronouns are never used to refer to Calisaylá. As a powerful wizard who could walk between the world of the living and the world of the dead, Calisaylá’s body and face were covered with tattooed symbols, incantations, and mystical sigils in unknown languages. They kept their naked body shrouded in magical red and gold smoke that never faded or faltered. Calisaylá was not given to overt displays of merriment and displayed an incredible willpower and sense of focus. According to Étienne Brûlé, Calisaylá possessed more raw magical power than any of the founders, and among their magical feats was a talent for summoning storms and controlling destructive weather. It’s alleged they had the power to conjure and pilot a hurricane and it is known that they could wield arcane fire. Casa Calisaylá is most associated with the cursebreaker path in honor of its founder, whose ability to decode curses included an as-yet-unable-to-be-replicated method of temporarily suspending a curse while keeping it intact, and leaving no trace of tampering. This talent was particularly useful for obtaining secret information, and Casa Calisaylá cursebreakers still strive to emulate their founder’s coolness under pressure and knack for getting people and objects to divulge their secrets. A few of Calisaylá’s own warding spells remain on the school, since their casting appears to be impossible to duplicate by wizards in the modern era. Cursebreaker students in Casa Calisaylá are driven to use their talents to unearth the truth, but they are also quite talented in hiding it. House members are very often into runes, rites, magical theory, secret codes, uncovering past knowledge, and solving puzzles and riddles (or making them). 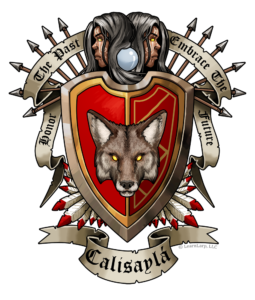 No knowledge or type of magic is considered off-limits, and members of Calisaylá flirt with the borders of traditions and laws in their quest to honor the past and embrace the future, the house motto. There is a strong oral tradition among the house members, of storytelling told around a communal fire, and of magic through sound and music, especially from instruments made from natural objects, such as shells, wood and stones. Calisayláns are known for their bold thinking, inclusiveness, and a general distrust in institutions. House members have a history of pursuing their own projects instead of coursework, and have a certain disregard for rules that limit creativity and autonomy.